There are hundreds of community platforms out there, but few elicit the endless fanfare that Slack receives. Though Slack’s purpose is to create internal community and conversation that makes work easier, countless customer-facing community builders have now adopted it as their community platform of choice. Slack was founded in 2009, but since then it has skyrocketed to become home to communities of four to communities of 5,000 and more. But just because it’s a great fit for others does not mean that it is the right fit for your community. So how do you know if Slack is the right platform for you? And how do you manage a platform that wasn’t intended for external communities? What’s a good use case for a Slack community? I’ve used Slack in both a company setting (to bring together a remote working team) as well as a topical setting (to bring together community managers who rarely find others who understand their jobs and unique problems), and it has been an incredibly effective communication tool in both cases. Although it doesn’t replace a support ticket system, Slack can be great for developer community support and feedback for developer-facing companies and is a great place to share, help, and bounce ideas around. It also helps some community members make their way up the community commitment curve by helping other community members. It may not be best for communities that may grow to over 5,000+ Slack members at this time (Example). In the Keen IO Community Slack, we have 1,274 members right now, and 369 members in the Women Who Code Austin Slack. Slack scales quite well. The smallest team I’m in has four people. The largest ones have thousands (Make WordPress, Post Status, and Buffer). I think Slack works effectively across all community types, though the integrations really shine when you’re in a community of practice or purpose. Slack was created for the workplace after all. The more your community reflects a team that’s working on something, the more value you’ll get out of it. For communities of interest, especially open ones like Buffer’s Slack community, Slack feels more like an old-school IRC network. You have a lot of people, a lot of channels, and a lot of noise — especially when folks start throwing around the @channel command. How do you get started with a Slack community and how do you manage the invite funnel? Our public-facing community Slack team for SparkPost has an automated Slackin sign-up system so that we don’t have to invite and approve each person manually. This was absolutely the right decision for this Slack community, given the rate of sign-ups (we’ve grown from a just-formed group to 2,400+ members in just over four months). The community professionals team that I manage started out with an invite-only policy and we’ve grown steadily via word-of-mouth recommendations (currently at 400 members). About a year ago, we set up a website and an application form. We’ve kept it this way despite the extra work because we want to make sure the group remains focused. We also use Slackin, which runs this page: keen.chat. It’s a little server that enables public access to a Slack server. Is it friendly to non-technical users to setup? Maybe not to everyone, but there is good documentation and deploy buttons to get started. As with any community you need to find your founders, the early-bird participants who will get the discussion going. Without the discussion, you’ve got an inactive Slack team and that’s no good for anyone. For managing invites, we’ve been quite happy with the Slack bots from Stacktodo. In our WPToronto Slack team, we have a channel set up exclusively for logging the bot’s invites. Every time someone joins, we see a message. If we want to slow down the growth, we can switch the bot to require approval on all invite requests. Our Meetup group has been the primary source of our growth. It’s an established place where we post events and send our email updates. So if people contact us via Meetup.com asking about WordPress help or job opportunities, we direct them to our Slack signup page (wptoronto.signup.team) and tell them to join #jobs. What are your tips for encouraging members who are new to Slack? I actually haven’t seen much push-back from people who aren’t familiar with Slack. They tend to be willing to try the tool, though they may be a little unfamiliar with the lingo (DM, channel, etc.) and how to use some of the additional features (emoji, code snippets, etc.). Slack actually has a great “Getting Started” guide for new users that’s easy to navigate as well. Exclusivity. There needs to be something happening in the Slack team that members won’t find anywhere else. For WPToronto, our hook has been the #jobs channel, where our members can post and find WordPress gigs in the area. We’re also talking about using Slack as the hub of virtual meetups, thanks to the handy Google Hangouts integration, which I suspect will bring in more people and more regular activity. You also need a super-easy signup process, as outlined above. 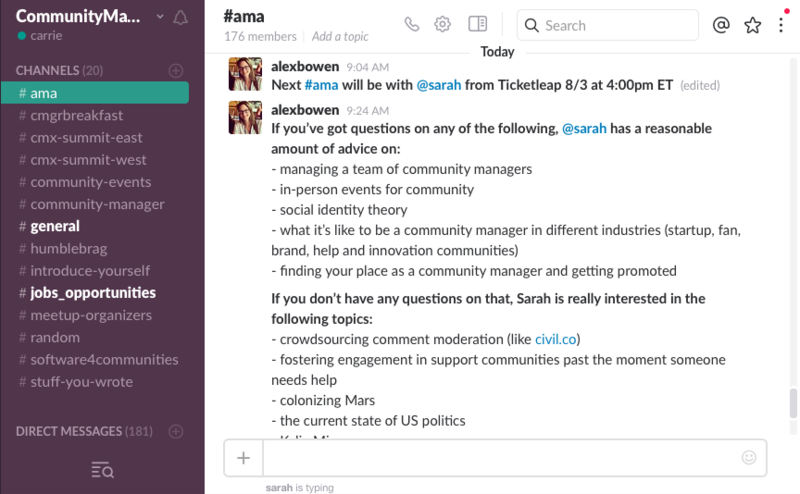 How do you keep your community members engaged on Slack? Honestly, they’re in maintenance mode (and working well!). With the SparkPost community channel, it’s fairly active with people asking questions, clarifying usage, etc. With the community professionals group, there’s a fair amount of activity with people asking questions, sharing new content, starting new topics, etc. We do have regular content that we post in the SparkPost community #announcements channel: developer-related blogposts, a weekly change log, alerts for the occasional service outage, etc., but nothing formalized to increase involvement. How do you create and define a “code of conduct” or “etiquette” for your Slack? We have a public code of conduct for both the community professionals group as well as our SparkPost community team. I’ve been a part of enough conversations on and off of other Slack teams to know that it’s better to have a plan in place just in case there are situations that arise. We don’t have any official moderators on either team, but we do have admins on the community professionals Slack that are fairly active, and the community members are good about moderating as well. For the SparkPost community Slack, our developer advocacy team is responsible for the upkeep as well as maintenance of the Slack team, so we keep a close eye on what’s being posted, who’s responding, etc. One of the challenges is the fact that we have an international audience, so what seems straightforward and to the point in some countries comes across rude in others, and vice versa. We’ve worked to keep level heads and understanding frames of mind while talking to people in Slack, and tend to pull them off into private conversations if things start to get out of hand, but we always start with a kind response and assuring them that we understand their frustration. This is actually one of my current projects at Keen IO, creating a Community Code of Conduct. It covers all community-related activities, in person and online. It helps lay out who the “moderators” of Keen Community Slack are and a reporting structure for when there are issues to be made aware of or addressed. It also covers what is unacceptable behavior within the Keen Community and what the repercussions are. Another shortcoming of Slack is that there are no official moderator titles within the application, so there needs to be some structure created to make sure it is a safe environment for everyone. We haven’t hit the point where we need a Slack-specific code of conduct. Most of our members come from our Meetup group, so there aren’t as many “strangers” as we suspect there would be with open Slack-only communities. I think that helps keep the behavior at an appropriate level. That’s not to say that we don’t see the importance of a CoC. We absolutely do. But if we’re going to create one for a specific platform, we’re going to do it the right way. What’s the one thing that’s been most essential in making your Slack community a success? For the SparkPost team, what kept us going at the beginning was the support of the rest of the company. We launched right after one of our top competitors announced that they were drastically changing their policies and company structure, and we immediately got flooded with folks interested in migrating to SparkPost. My team (as well as others) pulled several 12-hour days to maintain traffic in the new channels and make sure that new community members were taken care of. It was exhausting, and obviously not sustainable for a long period of time, but it worked for a few days, and allowed for not only great team-building experiences, but an opportunity to show our new community members just how much we care. It’s slowed down now, and is at a level that my team, along with occasional help from others, can easily maintain. We’re still tweaking things, and any changes that we make these days are often driven directly by community suggestions. We’ve also implemented a slackbot that allows us to reference help docs and sends all new members a welcome message telling them a little about the various channels. All of these little things have helped drive us to where we are now. No one goes ignored. Even though our members heavily rely on the Keen IO team within the Slack chat, community members will still help each other while some of us are asleep or no one is answering. Having an existing community on Meetup.com, no question. We’re not trying to grow by tapping into other communities. We’re just trying to bring more of our own members into an additional gathering place. What are some challenges you’ve encountered with the use of Slack as a community tool? Any time you have an open forum for your community, there are pros and cons. The pros? Immediate (and vocal) feedback from our users, in a way we’ve never experienced before. The way that we work as a company has completely shifted as a result. Never before have we had so much feedback from our community. We now have a weekly meeting including members from engineering, product, and developer advocacy to discuss and prioritize that feedback. Who is responsible and accountable for it? Since it is frequently used a Support channel for our users, is the Support team ever responsible for it? How distracting is it to the Keen IO team? How important is the archive to us?History of conversations can’t be a priority since the archive is small (although there is a way to download the whole archive in JSON format). How do we share awesome things from inside of Slack? How do we prevent a slowdown in attendance of Community Chats? How much does attendance matter to us versus engagement of those who do participate? Real-time noise. Forums and groups have the benefit of being asynchronous. To get value out of Slack, you need to be in there while the discussion is happening. Otherwise, it’s just an archive of information which, while useful for reference, doesn’t give you an opportunity to “jump in” and participate. Combine that with the default email notifications that Slack sends out: My inbox is filled with @channel notifications from teams that I’m a member of, but not actively participating in. I could log in and change the notification settings, but I don’t want to remove myself entirely. So Is Slack Right For You? While people are celebrating Slack’s ease of use and implementation, it’s important that we understand that Slack does have its limitations and challenges, like any other platform that your community may call home. That’s why learning from the insights of other community professionals who have used the platform before you is so essential. 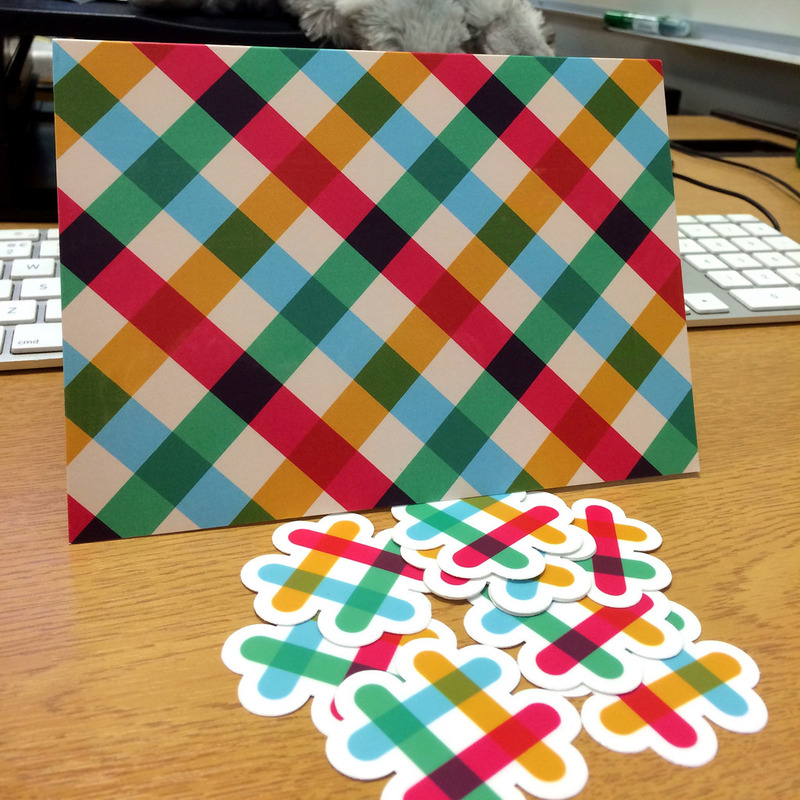 Want to join the CMX Slack Community? You’ll find a home for community managers right here. Apply to join.